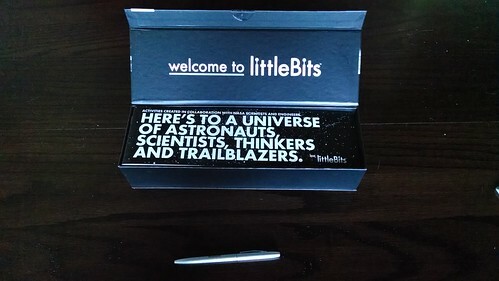 Disclosure: littleBits sent me a Space Kit for free so that I could review it. 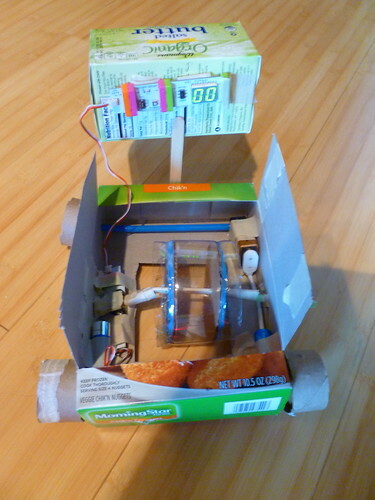 – ease kids into creating circuits without having to do any programming. – inspire kids (or anyone else) to really dig into all the technology that goes into space exploration and using satellites to conduct experiments. The box says ages 14+. Depending on the child, someone as young as 10 could enjoy the simpler projects. The younger the child, the more they would need assistance and scaffolding, though. 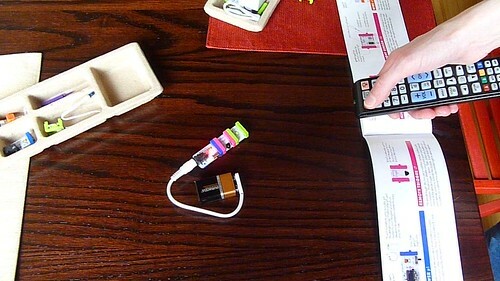 Note: A “bit” is a self-contained module that connects to other littleBits modules. Most projects in the booklet require some sort of craft supply or normal household object. 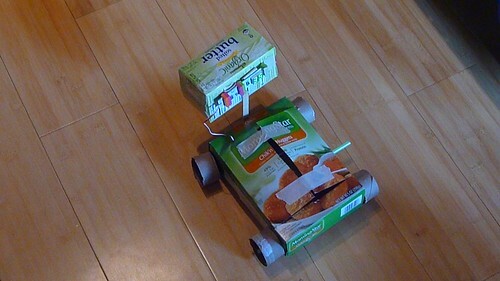 Projects I tried out called for things like an mp3 player, a glue gun, a tv remote, a small amount of milk, disposable dishware, tin foil, craft sticks, various sizes of boxes, and lots of cardboard and tape. If you are already well-stocked in recyclables and craft supplies, you’ll probably be fine. You’ll definitely want to read through the materials requirements for each project before you begin, though! Because I don’t usually buy disposable dishware or craft sticks, I sometimes found myself scrambling to find alternative materials. That isn’t necessarily a bad thing (here’s to problem solving and creative thinking!) but you may want to factor that into any considerations of how long a project will take you and how easy/difficult it will be to complete. What Was My Experience With It? 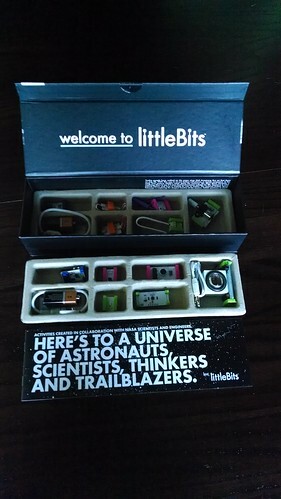 I’m entirely new to LittleBits, so the very first thing I noticed about my littleBits Space Kit was the design. The design on everything in this kit is amazing. The booklet of instructions is attractive, well-illustrated, and informative in addition to containing step-by-step instructions for each of the suggested projects. Even the box the kit comes in feels like a luxury item. The good design is most apparent on the bits themselves, though. Each bit is labelled as to what it does: “remote trigger,” “DC motor,” etc. That’s great for when you’re following directions for a specific project. When you’re just messing around with the bits, though, what’s even better is that 1) you don’t have to program anything, ever, and 2) the bits are color coded. Power modules are blue, input modules are pink, output modules are green, and wires are orange. You can easily swap out modules as long as they’re the same color–which means that it is incredibly easy to move from following the directions on a project to modifying the project to do anything else that suits your fancy. When you’re putting the littleBits together, they snap very satisfyingly into place. Because of the magnets in each bit, you literally cannot put them together incorrectly. I tested the kit out with a friend who has almost no circuit-building experience (we played with Snap Circuits together one time a few years back, and that’s it), and she especially loved that feature. It kept her from worrying about shorting anything out, and let her experiment freely with the pieces. She assembled and tested out her first circuit well under two minutes, and easily kept up with me as we played with the kit, despite the fact that I’ve been playing with circuits in the form of my Arduino for more than a year now. We worked our way through most of the simpler projects in the booklet, doing things like lighting up an LED when we pressed a button on a tv remote, and wirelessly transmitting sound from my iPod to the speaker that came in the kit. During that process, the booklet took us from explaining, “What is energy?” up to projects with lessons like, “Learn the science behind satellites and make your own parabolic reflector.” These projects (and the information in the booklet) inspired all kinds of further questions in my friend and me. For that reason, I think that this kit would be a wonderful lead-in to an independent research project. The wireless transmission project is an example of why there are two power bits in the Space Kit: We had one circuit to do the transmitting, and a second to do the receiving. That same project is also an example of a time when some experimentation was necessary beyond the directions in the booklet, since it turned out that this project works *much* better in a dark room–which I couldn’t find anywhere in the directions. Eventually we worked our way up to the more involved projects at the end of the booklet. These projects require more supplies, and also take much longer to complete. The big project that we focused on was making our own Mars Rover. Our finished product. Click through for video of the rover in action! – Building the circuit was very easy. – As always with littleBits, there was no programming required. – At the end, we really did have a little rover that we controlled with a tv remote, and that displayed what it was picking up from its light sensor as it went. – The idea that NASA needs line of sight communication with Mars in order to control their rovers was driven home by the way our rover only moved if you hit the remote sensor with the IR from the rv remote. – I had made the mistake of taking out the recycling the day before we began this project, which greatly limited our choices of supplies. – We had trouble figuring out things like what size box to use for the rover’s body. The box we ended up with made our lives difficult by being too small to easily arrange all the necessary parts inside. – The booklet’s directions for an axle holder for the center wheel didn’t work for us at all. We ended up making our own system to hold that wheel in place, using another straw and a hole in the outside of the box. – We tried using a popsicle stick instead of a craft stick to attach to the motor and power the Rover. We never did manage to keep the popsicle stick attached to the motor for more than a few seconds of driving at a time, although judicious use of masking tape improved things considerably. – We made some miscalculations when assembling our center wheel, and as a result our Rover went in circles. – We had to add counterweights to the back of our Rover to keep it from tipping over due to how we had to arrange the motor, the battery, and the light sensor/display part of the Rover in order to make everything fit. Now, these setbacks were sometimes frustrating. I want to put that out there, because it’s worth keeping in mind, especially if you’re working with someone who is easily put off by setbacks. That being said, we’re supposed to be makers, are we not? And that’s all about realizing that something is a problem, and then trying out ways to fix that problem. Thus, you can look at the limitations of the booklet as either a design flaw, or a feature. I’ll leave it to you to decide what you think! – Ability to manipulate relatively small pieces (without putting them in their mouth). – Understanding that everything you make with the kit needs a power source. – Understanding (or patience to learn) that any input will affect the outputs after it. – Some very basic level of understanding of electricity. – Basic knowledge about our solar system, that the moon orbits the earth, etc. – I would have loved assembling some of the very simplest projects when I was 10 or so and was first introduced to electricity in science class–but I would have needed an adult or an older kid on hand to help and to explain things. – I would have been able to assemble the circuits easily and focus my attention instead on the takeaway lessons if this had been included in, say, my 9th-grade earth science class. (The project about studying the atmosphere from a satellite springs to mind as one that would have fit into that class well.) This actually lines up well with the suggested minimum age of 14 that’s printed on the box. – I actually had a lot of fun with it now, as an adult. It led me to asking some questions about satellites that I hadn’t thought to ask before. – I’m excited to take this into work to use as part of the Tech Petting Zoo that our Emerging Technologies Librarian puts on; I fully expect this kit to be a big hit with the college students and occasional adult who attend those. As long as you can keep track of the pieces and have enough craft supplies at hand, the kit should do well in a makerspace, classroom, or library. If you have books or other resources about energy, satellites, NASA, the solar system, etc., display those near this kit. I bet you’ll get a big boost to their use! I'm the Webmaster Librarian at SUNY Oswego. The coolest thing I ever made is a crocheted scarf/hood thing that lights up in different patterns depending on how fast you're moving.